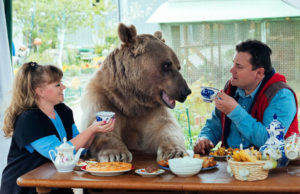 Stepan is a domesticated bear that lives with his fellow pet humans Svetlana and Yuriy Panteleenko from Moscow, capital of Russia. This huge bear was adopted as a 3-month-old bear cub when he was found by Russian hunters during their patrol. He was in a very bad condition as he was orphaned and alone, this is why good Svetlana and Yuriy decided to take him hope and adopt him. You should know that having such a big pet is quite expensive as Stepan eats over 25kg of fish, vegetables and eggs every day! But thanks to his garden work ethics and running around the football ball he keeps his weight in balance.